Happy Wednesday – the work week is almost done. I don’t know about you, but I love the weekends and Wednesdays always remind me we don’t have much farther to go. HHH#1 Spring is finally here. Gather all your winter sweaters and drop them at the dry cleaner on your way to work. HHH#2 Wipe down all of your gadgets that are in everyone’s hands everyday – remotes, computer keyboards, buttons on the microwave. HHH#3 Time to purge the Easter candy! Select enough pieces for everyone in your family to have one piece each day through Sunday. Get rid of the rest by bringing it to work, putting it in your apartment building lobby, or sending it into school with your kids for the Teacher’s Lounge. Happy Hump-day! 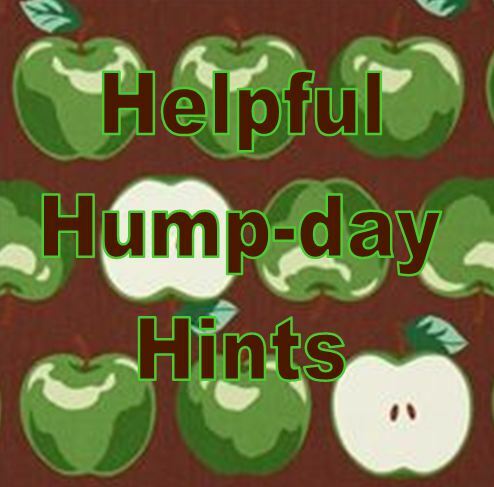 Let me know if you accomplish any hump-day hints today. Congrats to Nina from les petits presents for making the 100th comment on my blog! You prize will be mailed this week! ha ha – I put all our extra on the front desk at work and it was gone before noon, I am sure you are not surprised!